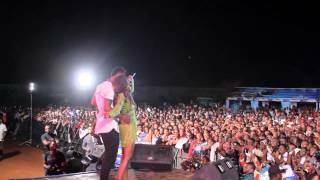 Watch Mavin Records first lady, Tiwa Savage, seductively dance with a lucky guy on stage while performing the hit song "Oyi remix (I Dey Catch Cold)" at the Trek 2014 concert in Ekwulobia. It was a complimentary live performance given to one of Tiwa Savage's fan at the show as a form of appreciation. Video courtesy Tiwa Savage.